Have you ever felt that you cannot leave a landing page? Not due to an interesting content, but because it simply does not let you close the window. It is definitely not the best way to capture attention. In this article we are going to talk about qualitative landing pages that are able to turn your visitors into customers or followers. In order to grasp interest and collect emails, many startups rely on that faithful “coming soon” pages. However, you can still use landing pages even if you are not a marketer, since you may need a bit of advertisement for your services. Landing page will simply help you make more money. So let us begin with the basics. A Landing Page. What is it? To be short, a landing page is any page your visitor ends up on after clicking on the link. Here we will talk about a landing page which will motivate users to do a specific action. Whether it is to buy your book, hire you as a designer or sign up for your newsletter. Good landing page should be operated like an island. It should have only one focus – convincing your visitors to make the needed. A regular website displays tabs like “about”, “contact”, “blog”, etc. A landing page, on the contrary, provides only one way – either you answer a call-to-action or go away. While being straight-forward, a landing page works much better. 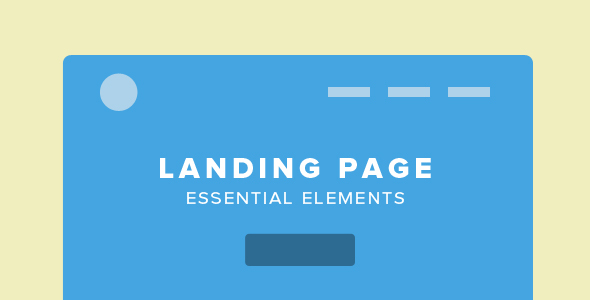 Why it is essential to have a Landing Page? Selling is the only and main purpose of any landing page. You’re either selling information, design services or shoes. Your information doesn’t always include a monetary transaction, since it may come in the form of downloadable books, newsletters, design freebies, courses, pay-what-you-can fonts, etc. Your goal is to convert users into clients or subscribers. Thus, a landing page is needed to get benefits. Just let your landing page speak for you. You may tell that you are for example an awesome designer or share your rate. It’s expected in a landing page so you can do it without any shyness. Successful landing page should have no navigation. Why? Because your visitors should be focused on your call-to-action without being distracted by any options of your menu. They would completely forget about your offer if you provide full menu on a landing page. Your visitors will look through your portfolio or read your blog. First of all, remove all possible distractions! The only clickable option on your landing page should be your call-to-action. Speaking about layout, there is no single set of rules. It is better to greet visitors with a beautiful background image which will convey the mood of your call-to-action. For example, if you are selling an application or software, show a video with it at work. If you need donations, show a picture with sick children. Then place your offering next to the image and include a descriptive call-to-action below it. Make it unavoidable and obvious. Visitors shouldn’t need to scroll down to see your call to action, it should be placed above the fold. However, it doesn’t mean it shouldn’t be below the fold too. Some landing pages work in long form to explain the product`s or service`s benefits in detail. If you choose this way, just don’t forget to place your call-to-action on each “part” of the screen. Colors create mood. Frito Lay, Coca Cola, Pizza Hut, Nabisco and McDonald’s know this and use yellow and red to stimulate excitement and hunger. Google tested 41 shades of blue to see which one will resonate most with their users. Applying this to your landing page, red color generates excitement and grabs attention. Blue is perfect for sincerity in communication. These two colors are the best solution to a call-to-action button. As for the background color, the clean simplicity of white or the authority of gray will be just perfect. However, you should avoid using multiple colors on your landing page. To convey your message, two or three harmonious colors will be enough. Who does not like pretty pictures? Our brain can process pictures faster than text. Use pictures that convey the mood of your service or product. This is where you can use your imagination. For example, it feels horrible to see a stock image of some man who apparently doesn’t know that you exist, doesn’t know about your product and doesn’t use it. Just find an authentic picture of people who actually use your product. When you show images of business people using your product, you visitors will believe you more. It needs to be an accurate representation even if those images are not professional photographs. Why? Because you need to build trust with your future audience. Each element on your page needs to support this case. You need to show realness on a landing page. Use a mock-up or an illustration if you don’t want to use a photograph. There is a reason to consider video being a popular choice for landing pages. It can increase conversion almost by 90%. If your service or product needs an explanation, you conversion rate will depend on the customer`s understanding of it. In this case, it is better to use a video option. Make your video sweet, short and straight to the point. It should focus on how easy it is to use your product instead of explaining how to use it. When looking at your landing page, all people should think “what it has for me”. So each video or word in text should answer that question constantly. Content is aimed to inform. Copy is aimed to sell. That is the main difference between copy and content. Use copy on your landing page. It is not easy to prepare copy, however an effective copy guarantees that your visitors will click call-to-action button. Firstly, find out what makes people interested in your products or services. Then use it as a trigger. For example, why would people want to buy your shoes? The answer is that the potential customer wants to have a great look. So your copy should answer his/her request instead of telling about how great your services are. Give people what they want. Focus directly on your clients needs. The call-to-action tells your visitor what they should do and it is the key element on your landing page. It is better not to use standard “submit” button. That is a horrible word! People don’t want to submit anything. Your aim is to create a call-to-action which will reflect the tone of your landing page. Depending on the topic, it can be serious or fun or. And it definitely should be personable. Use simple forms only. Actually, it will be better to use one field form – email address only. If you ask for daytime phone number, date of birth, blood type or mailing address you will turn away a lot of visitors in most cases. Remember: people do not like to share that kind of information with you until they know who you are and decide they can trust you. You should understand and respect that point. Once you establish a relationship, you can always ask for more information. But not earlier than that. People do not like feeling lonely. So add testimonials or other forms of social proof on your landing page. It is is a great place for that! Include some references to validate the testimonials. Use websites, names, Twitter handles, photos alongside the testimonials. Another great way of social proof is to display the total number of subscribers to your mailout. For example: “Join 20,105 folks who have already signed up for the newsletter!” It is a simple, but effective way, since small details do increase conversion. Nowadays, more than 80% of total traffic comes from mobile devices. That is why it would be better to have a responsive landing page. Make sure it can respond to every viewport. All of your hard work will be for nothing, if your landing page looks awful on mobile devices. We hope that his short article will inspire your imagination to create a qualitative and successful website. It’s now or never as Elvis sings! Use our simple advice and have fun creating a landing page.